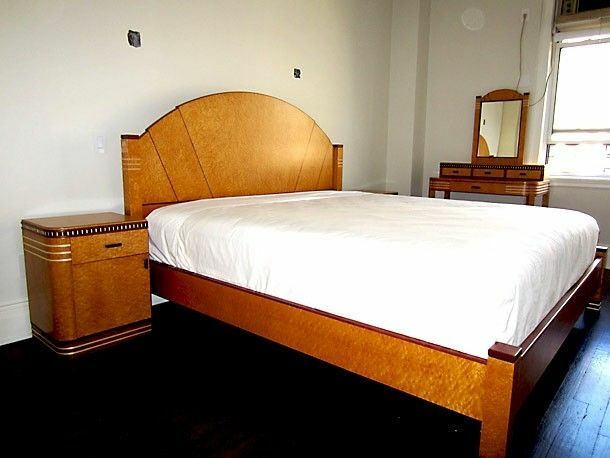 This custom commission consists of a King Size Bed, two Night Tables and a Dressing Vanity. The client has a walk-in closet so no dressers were needed, but dressers can be designed to finish off your set. The set is made of lightly stain Birdseye Maple, Bubinga and Ebony. You can view the entire Art Deco portfolio here on the website to pick designs that can be adapted into a custom complete Art Deco Bedroom. You can also present design concepts viewed in books or online to start the design process.